Join us on the National Day of Prayer as we come together to celebrate and pray for the City of Brea. Register and pay online by Monday, April 29 at 4 pm. Tickets are $30 each. If you'd like a whole table, please purchase 10 tickets ($300). 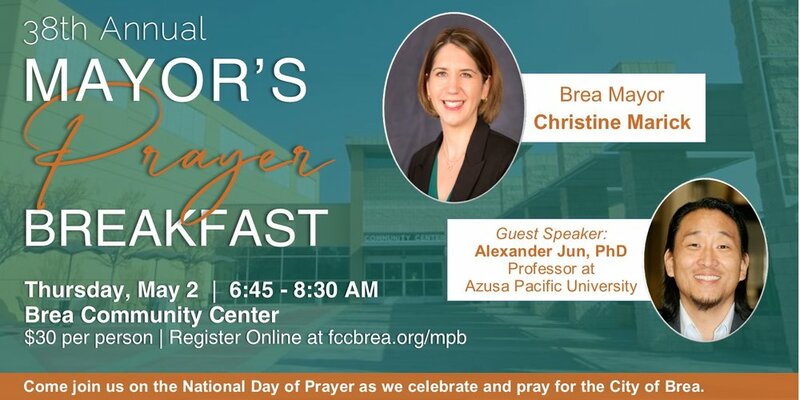 As part of this event, we'll get to hear from Mayor Christine Marick and Professor Alexander Jun, Ph.D.
Mayor Christine Marick is currently serving her second term on the Brea City Council. She currently serves on the Orange County Public Library Advisory Board, as well as the City’s Development Committee and Investment Advisory Committee. Mayor Marick will give us an update on our City. Alexander Jun, Ph.D., is Professor of Higher Education at Azusa Pacific University. Alex conducts research on equity and justice in higher education around the world. A TEDx speaker in 2012, Dr. Jun was also a Global Fellow with the Center for Khmer Studies (CKS) in Cambodia in 2010, an International Research Fellow at Curtin University in Perth, Australia in 2016, and a 2018 Scholar in Residence at Belmont University in Tennessee. Jun currently serves as Associate Editor of the Journal of Behavioral and Social Sciences. He is the author of From Here to University: Access, Mobility, and Resilience Among Urban Latino Youth (Routledge, 2001). He also co-authored two books recently. The first is entitled, White Out: Understanding White Privilege and Dominance in the Modern Age (2017). The second is White Jesus: The Architecture of Racism in Religion and Education (2018). His third book, White Evolution: The Constant Struggle for Racial Consciousness, will be out in the fall of 2019. A Ruling Elder at his local church, New Life Presbyterian Church in Fullerton, CA, Alex was elected Moderator for the 45th General Assembly for the Presbyterian Church in America in 2017. He is married to Jeany and they have three active teenagers.